Directions Take the test. Simply hold the stick pointing downwards in your urine stream for 5 seconds only. Wait. An hour glass symbol will flash to show you the test is working. Read your result. Within 3 minutes your result will be displayed in words (Pregnant or Not Pregnant). Read instructions before use. Store at 36-86 degrees F (2-30 degrees C). Do not freeze. Uses Results in words. Over 99% accurate (99% accurate at detecting typical pregnancy hormone levels. Note that hormone levels vary. See insert.) from the day of your expected period. 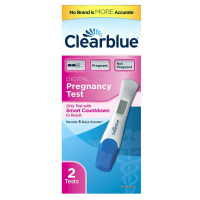 Clearblue Easy can be used as early as 4 days before you expect your period. 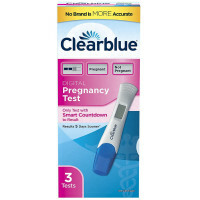 That's 5 days sooner than waiting until you miss your period to test. The amount of pregnancy hormone increases rapidly in early pregnancy. In clinical testing with early pregnancy samples, Clearblue Easy gave the following results: Number of days before the expected period: -1. % of samples from pregnant women giving a pregnant result: 95%. Number of days: -2. % of samples: 90%. Number of days: -3. % of samples: 82%. Number of days: -4. % of samples: 51%. Contains: 2 test sticks and 1 English/Spanish insert. Warnings Keep out of the reach of children. Do not freeze. For In-Vitro diagnostic use only (not for internal use).